Following last week's post about Pigeon Press and Alvin Buenaventura, I thought it'd be nice to feature an old Buenaventura Press book this week that I picked up from Alvin during a book fair in 2009. 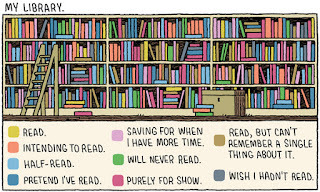 This is Tom Gauld's The Gigantic Robot: it's a very short picture book that reads like a children's fable, printed on thick paper with these great rounded edges like an old composition notebook. It's sparse but absolutely wonderful (and with a resonant, cautionary message, too!). 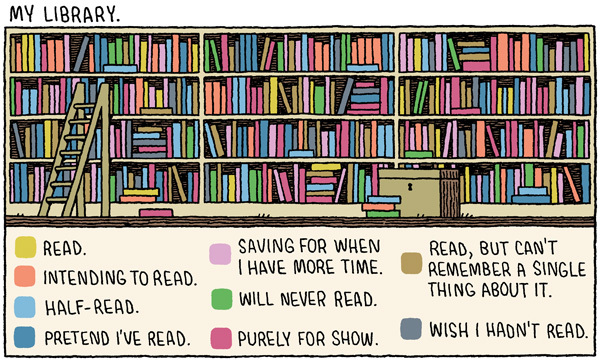 I see that "My Library" is available as a print from Tom Gauld's site... take a look!